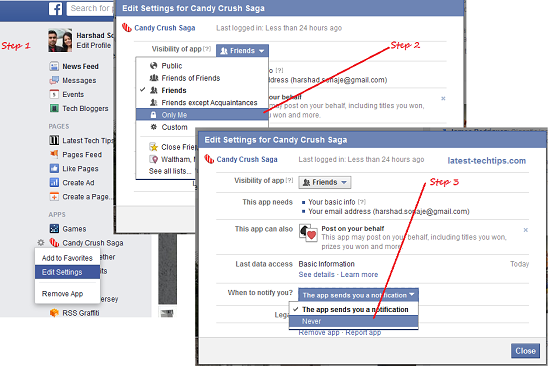 I have seen many Facebook users blasting their Facebook friends to stop sending Candy Crush notifications. Instead of requesting every friend in your list you can disable the notifications permanently and this is how you can do it. 1. Login to Facebook from the web. 4. Check for a setting icon to the left of the App. 6. Check Visibility option, set it to Only Me. With this you are all set to enjoy your Facebook experience sans Candy Crush. If you liked the post and if it worked for you share it with your frustrated friends and like our Facebook Fan page.